Now that we're well into May and summer is creeping ever closer, I'm starting to crack out my bottles of self-tan again. I've got a few weddings coming up, so I've been hunting for the ideal, tanning combo to take the edge off my ghostly, winter skin. 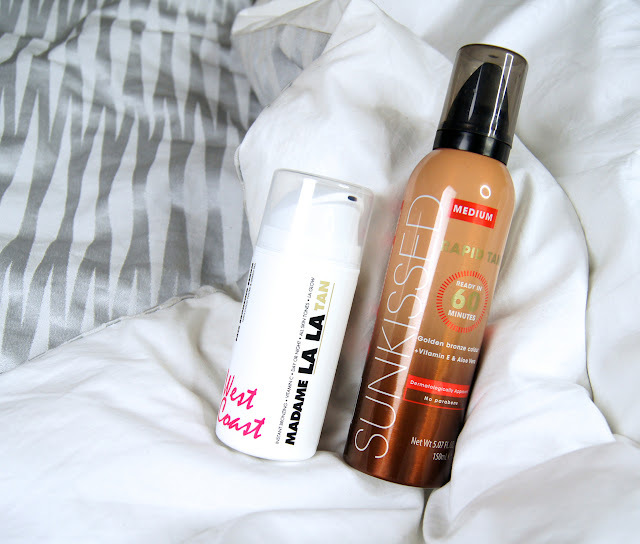 After trying out a few formulas, I've finally found the perfect faux-glow pair in the form of Sunkissed Rapid Tan Mousse in Medium* and the Madame La La Face Bronzing Serum*, which give me a natural, healthy colour, without any orange overkill. For my body, I've honestly discovered a new, holy-grail product. For years, I'd put my faith in premium brands - St Tropez, Xen Tan and Vita Liberata lined my shelves and I was a total tanning snob, without ever giving cheaper brands a chance. 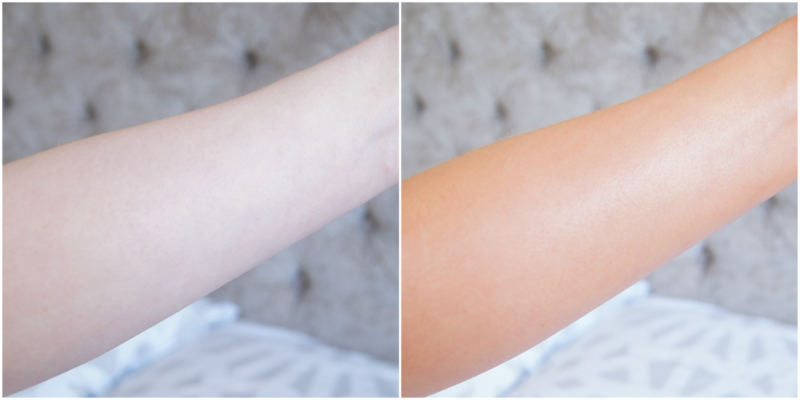 So, when the Sunkissed Rapid Tan (£3.99) arrived at my door, I was excited about the possibility of slashing my fake bake bill and discovering an extremely affordable alternative to my pricey products. Firstly, this bronzing mousse smells good enough to eat - I'm talking caramel, ice-creamy heaven. The foam is so silky and lightweight, with a lovely guide colour to ensure an even coating all-over. Blending quickly and drying in seconds, it's a dream to smooth on and there's no need to stand like a zombie for half an hour once you're done, as there's no sticky or greasy finish. As this dermatologically-approved tan is infused with Vitamin E and Aloe Vera, my skin is left soft and hydrated after use. Music to my ears when mousse formulas often leave my skin feeling tight and itchy. 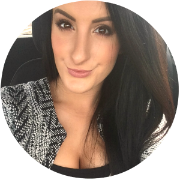 What's so amazing, is that this formula works to give you a golden glow in just one hour and the longer you leave it after that, the darker you get. Not only is that super convenient if you want to tan last-minute, but it also means you can customize the depth to suit your taste. The initial colour you're left with, straight after application, is slightly muddy with a grey cast to it, so I personally wouldn't wear it during the day or on a night-out. It's a tan that I'd use when I'm at home all day and can chill in loose lounge-wear, or plan to let it develop overnight. Once removed, the colour is even and creates a natural, subtle, olive tone. It doesn't scream 'she's been tango'd' and the colour isn't obviously fake even when it's been left on overnight. What's so impressive about this product, and what I had assumed would be it's downfall, is that it's such a forgiving formula. On first use, there were a couple of small areas that I'd missed and had to patch up a bit, but you'd never guess the next day. To apply the mousse, I like to use a mitt to thoroughly blend and buff the product in, without being left with tell-tale, orange palms. Having tiny hands, I have to fight to stop the one-size-fits-all mitts from slipping off as I apply, which can be frustrating. It's worth putting up with, though, as my tan always looks more flawless and lasts longer when I use one. I always make sure to exfoliate my body well and moisturise my elbows, knees, feet and hands prior to tanning, to prevent the tan clinging to any dry areas of skin, but I'm still occasionally left with a darker colour in those areas. With the Sunkissed Rapid Tan the colour is always totally even, with no patchy areas whatsoever. As the tan develops, that recognizable biscuit scent does start to rear its ugly head, but once rinsed off it completely disappears. With other products, that biscuit scent normally continues to linger a couple of days later, whenever things get a little hot or sweaty, but that doesn't happen with Sunkissed's creation. Added bonus - I've got seven full body application out of my bottle so far and it's still going strong! Not bad, considering it costs under £5. Honestly, I'm totally blown away by how well it performs and I've already purchased a back-up bottle! Having never been a fan of using the same product for face and body, I always used to skip applying self-tan to my face. Kindly, I was sent the Madame La La West Coast Face Bronzing Serum (£24.99) and it has literally transformed my routine. Infused with coco water and green tea, plus a multitude of vitamins, this serum not only works to perk up the complexion, but also helps to hydrate, brighten, fight signs of aging and boost cellular renewal. Pretty good, right? The bronzing serum has a gel-like feel to it, which is instantly refreshing and hydrating on contact with the skin. The consistency is fairly watery and light, so it sinks in completely and there's no horrible residue left sitting on top of the skin. But, that does mean you have to work with it quickly, to make sure it blends well before being fully absorbed. Despite the sheer texture, the tan is highly pigmented and one pump is more than enough to achieve a strong colour. Personally, I prefer to put it on before bed and wash it off in the morning, as I do with my body tan. But, you can use it in the morning, either alone or under makeup for a bronzed boost, or even mix it with your foundation to amp up the depth of colour. 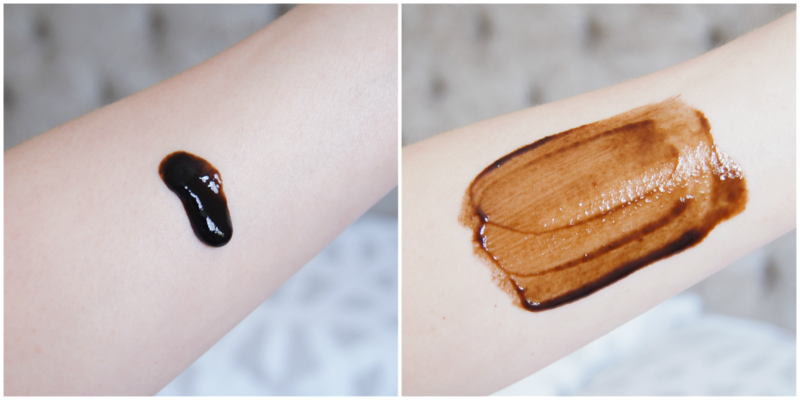 On waking up, my face does look scarily dark and muddy, but as soon as it's rinsed off, the colour settles to a natural-looking, olive shade. To apply the serum, I just use my fingers. I can't be bothered with a mitt or brush and find that the colour always looks even if I make sure to smooth it on, rather than rub it in. As long as you wash your hands straight after application, there's no embarrassing staining to contend with the next day. Like I do when prepping my body for fake tan, I also like to exfoliate my face before application. And, to almost dilute the colour slightly and make sure it doesn't cling to any dry patches, I always follow up with a good dose of moisturiser. I had been really concerned that the serum would break me out, dry my skin or cause redness/irritation, but there really was no need to worry. After rinsing, my skin feels so soft and plump, just like when I use one of my regular, moisturising serums. Of course everyone reacts to skincare differently though, so whilst I may have no issue with this product, there's always a chance you might. So, as always, I recommend proceeding with caution if you have particularly sensitive skin. This bronzing serum may be quite pricey, but you need so little per application and I'd prefer to pay a bit extra for facial products, to make sure my skin is well looked after as it gains a bronzed glow. What are your favourite tanning products to achieve a golden glow? Wow this has made a huge difference! Your legs look so sunkissed! This is definitely one of the best fake tans I have ever seen! I hate orange knuckles, so that sounds great!